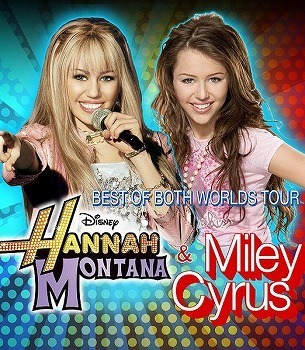 The Best of Both Worlds Tour was a 2007-2008 North American concert tour featuring singer, songwriter and actress Miley Cyrus of the Disney Channel series Hannah Montana, performing both as a solo artist and in character as Hannah Montana. The tour is named after the theme song for the series, "The Best of Both Worlds", which reflects the dual nature of the series' character. The tour had the most in-demand concert tickets of 2007. The concert tour was choreographed, created and directed by Kenny Ortega, the director and choreographer of High School Musical, High School Musical 2, and The Cheetah Girls 2. The concert in Salt Lake City, Utah was recorded for the live album and was also aired on Radio Disney with interviews with Miley in April 2008 as a part of Planet Premiere. The Best of Both Worlds Tour won the Billboard 2008 Touring Award for Breakthrough Act. Cyrus performed both as herself and in character as Hannah Montana on a North American Best of Both Worlds Tour with 69 total dates, 14 more than previously planned. The Jonas Brothers were the opening act for most of the tour. Tour tickets for each date sold out in record time after they went on sale, disappointing a large number of fans. The tour was recorded and released to cinemas in Disney Digital 3-D. The concert film brought in $8,651,758 on its opening day, and continued on to gross $31,117,834 to finish off the weekend, making it the highest-grossing opening weekend for a film to be released under 1000 screens, and on July 26, 2008 it was released on Disney Channel.